Here’s a little soundfont I made of my sister’s 68 slingerland drum set. You can download it here The video is just some simple patterns I put together in seq24 just to demo the samples. Pretty cool vintage sounding drums. This soundfont is cross-platform, but you will need a soundfont player. 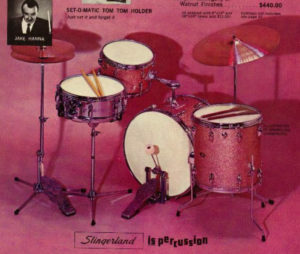 This entry was posted in loops and samples, Plugins and tagged slingerland drum set, slingerland drums, slingerland drums buddy rich, slingerland drums craigslist, slingerland drums for sale, slingerland drums history, slingerland drums logo, slingerland drums on ebay, slingerland drums serial lookup, sound font, soundfont, soundfont bank manager, soundfont creator, soundfont download, soundfont editor, soundfont files, soundfont maker, soundfont midi player, soundfont player, soundfonts, soundfonts for fl studio on January 16, 2017 by DemonicSweaters.